WTR Engineering, a wholly owned subsidiary of WesTech, has over 100 years of experience and considerable expertise in water filtration – including a variety of bar screens and screen rakes. Over the years, its team of experts has consistently demonstrated the ability to quickly identify customers’ needs, help them determine the best solution, and provide the equipment customers need to implement the solution. 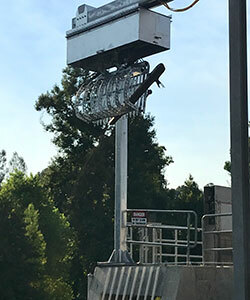 As a case in point, the WTR Engineering team recently won an opportunity to provide equipment for a fish hatchery in Northern California. 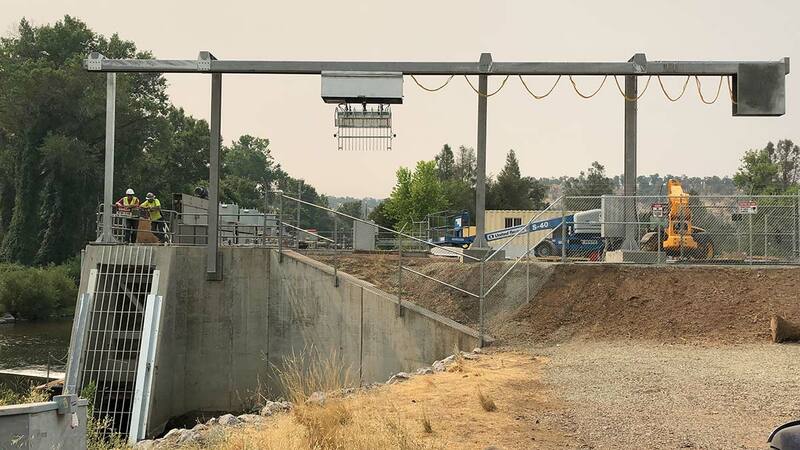 The customer’s requirement was for a specific type of trash rake system designed to clear debris from a bar screen at a raw water intake located along a large creek, which provides water for the hatchery. 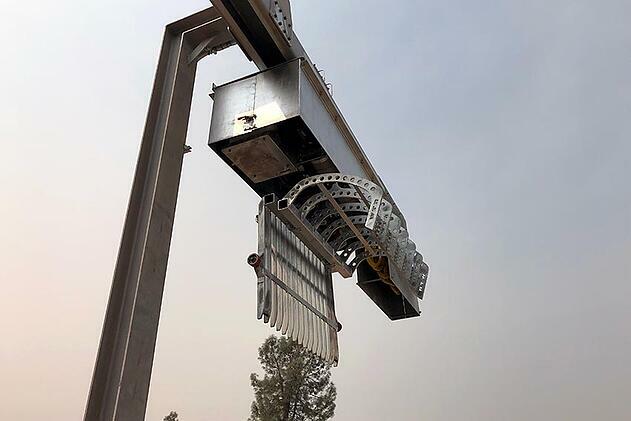 The contracting company that won the customer’s bid purchased WTR’s Talon Rake™, an overhead monorail-style bar-screen rake. The rake captures waterborne debris that gets trapped against the bar screen, such as logs, twigs, leaves, shopping carts, etc. The WTR project team for this opportunity included industry veterans Trent Gathright and Wesley Reetz, whose 80-plus years of combined experience in water filtration have resulted in several areas of expertise – researching, designing, manufacturing, rebuilding, and installing screening plant equipment, for example. The team also included Ryan Holbrook, who has managed hundreds of similar projects and whose resulting project-management expertise proved highly beneficial to the success of the project. While WTR’s product line includes bar screens, the bar screen for which it designed the Talon Rake was already in place. The Talon Rake is inherently adaptable to existing sites – no civil modifications required. The rake’s purpose is to prevent harmful debris from reaching a series of pumps that lay downstream. The pumps’ purpose is to deliver water to the fish hatchery, which the customer oversees to facilitate fish restocking. The rake’s primary purpose is to clear debris off the screen so that water can flow through it. “[The rake] has the capacity of picking up a small car,” explains Holbrook. The rake’s capacity enables it to handle anything that the creek is capable of carrying along in its current and can remove up to 80 cubic yards per day of debris. The rake itself resembles a claw, with a flat side that slides down the bar screen, closes around trapped debris, and pulls the debris out of the water. It then traverses the monorail and dumps the debris into a receptacle for easy removal. In other words, the Talon Rake both cleans and transports debris. Both WTR and its competitors could offer a rake that met the customer’s requirements. However, owing to its expertise, WTR could deliver the Talon Rake 60% sooner than its competitors, helping to keep the winning contractor’s project on time and within budget. Furthermore, with the Talon Rake, the contractor could take advantage of an experienced team that could identify unforeseen pitfalls a project such as this might experience. To meet the customer’s needs, this new rake implementation is slightly different from WTR’s standard Talon Rake system. For example, the customer’s specification required hydraulic cylinders to open and close the rake’s claw. The standard Talon Rake systems use mechanical means to do this, thus eliminating hydraulics within the water. Talon Rake’s standard mechanics are generally housed in the carriage, a design that is cleaner and easier to maintain compared with that of hydraulic systems. In addition, the customer’s specification required festoon cables to power the motors, sensors, and hydraulics. The standard Talon Rake uses a monorail electrification system, the electronics of which are located in the monorail. Festoon cables blow in the wind, which can sometimes wrap them around the monorail. The Talon Rake’s standard implementation prevents this problem from occurring. “Once the project started up,” says Holbrook, “we advertised the benefits of our standard Talon Rake over the competition’s rake. Mechanically speaking, it’s a much superior product because it doesn’t have the hydraulics or the festoon cables. We’ve built a better mousetrap,” he adds. 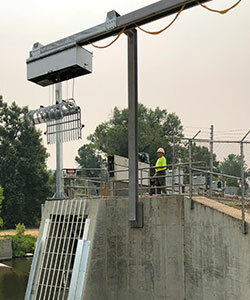 WTR’s team estimated that it would take the contractor about two weeks to commission the Talon Rake system, but installation went so smoothly that it took less than one. While training the customer’s personnel to use and maintain the rake, the WTR team noted that the workers’ responses were unfailingly favorable. In addition to the one-button manual start, Talon Rake customers can start the debris rake cycle via differential control, built-in timers, or the plant distributed control systems (DCS). The Talon Rake also includes a handheld wireless manual remote controller, for conditions when manual operation is required. The Talon Rake’s typical control system includes a human-machine interface (HMI) touch screen with a programmable logic controller. As this example project illustrates, the Talon Rake is an economical and effective system for protecting downstream equipment from waterborne debris. It is an ideal solution for numerous industrial and municipal applications, including power plant and industrial raw water, canal and waterway protection, sewage treatment plants, and virtually any other coarse water filtration application. WTR offers Talon Rake screen rakes and bar screens in a variety of application-appropriate materials – including galvanized steel (the material used for the fish hatchery), stainless steel, and aluminum bronze (for hazardous areas). WTR also uses state-of-the-art engineering, including 3D modeling, FEA, STAAD, and other advanced engineering tools to verify fit, function, and conformance. Talon Rake customers have the option to add multiple rakes to the same monorail, making it as suitable for larger applications as it is for the fish hatchery’s smaller, single-rake system. The ability to customize the Talon Rake to meet a wide range of applications and specifications is a natural result of WTR’s experienced team, as is the ability to produce a better product than competitors with a much shorter delivery time. Interested in working with WTR on a bar screen rake project? Please use the Contact Us form to submit your request.